AMD today launched a new high-end graphics cards for data centres to coincide with its presence at VMworld, Las Vegas. 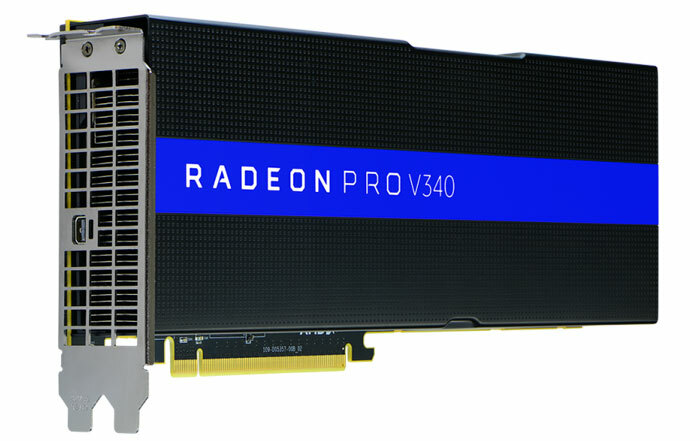 It is claimed that the AMD Radeon Pro V340 graphics card delivers extreme performance and high user density for virtualised environments. Inside this dual-GPU card is powered by 14nm FinFET GPUs based upon the Vega architecture. Furthermore, it packs in 32GB of fast HBM2, and is the first VDI hardware solution to offer so much memory, says AMD. As you can see above, the Radeon Pro V340 provides 7168 stream processors and has a TDP of 300W, though it is passively cooled (it will be inside an adequately cooled server rack). For this hardware to appeal to those building servers for data centre visualisation workloads (CAD, design, rendering and so on) AMD MxGPU Technology, based on the industry-standard SR-IOV technology, comes into play. AMD says its hardware and software combo "delivers fast, stable and predictable performance with the industry's highest user density, without requiring recurring end-user license fees". In its press release AMD shared testimonials from VMWare and Citrix, supporting its claims that the AMD Radeon Pro V340 graphics card is an excellent new choice for secure virtualised resources, for the most graphically demanding applications. Superior User Density: Supports up to 32x 1GB virtual machines, up to 33 per cent more than the competitive solution. Availability of the AMD Radeon Pro V340 is expected to begin in Q4 2018. Would love to see a watercooled mainstream version for gaming hit the shelves… seems unlikely at this point though. Maybe in a few years, when developers have got to grips with Vulkan/DX12 multi-GPU rendering techniques, this kind of card would be pretty awesome for gaming!